It's been a while since I posted any introductory posts. I thought I'd briefly write about one of my favorite stelae from the ancient Near East period, the Victory Stele of Naram-Sin (shown below, 2254-2218 BC). 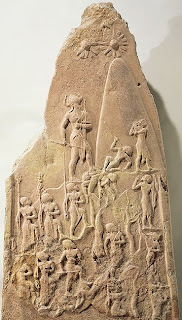 This pink sandstone stele is my favorite piece of Akkadian art. It is one of the first pieces of art to depict an actual historial event; the stele commemorates Naram-Sin's victory over the Lullubi people. I've had professors posit different ideas about these stars. Some think that the two depicted stars represent the dieties Shamash (the primary diety for the Akkadians) and Ishtar (the goddess of love, marriage, beauty and war). Therefore, the inclusion of these stars could indicate the gods' favorable view of Naram-Sin. It also could be that Naram-Sin is walking up the mountainside in order to make a sacrifice to the gods, thanking them for his victory (which further propagandizes that Naram-Sin has divine support). This theme (the relationship between rulers and diety) is familiar in ancient art, which makes me think that this theory has some creedence. But if there were other stars depicted on this stele, which gods did they represent? How can we ensure that the attribution of gods to stars is not arbitrary? I've had another professor who wondered if these stars could represent an actual cosmic event that took place during the battle or victory. I think this is a really interesting thought, though I don't believe there is any extant evidence to support this idea. It's kind of fun to think about, though. Since this stele was one of the first pieces of art to depict a historical event, it's fun to think that historical accuracy extended to a depiction of what the stars looked like. What do you think about these stars? What's your favorite part about this stele? 1 Dominique Collon, et al. "Mesopotamia." In Grove Art Online. Oxford Art Online, http://www.oxfordartonline.com.erl.lib.byu.edu/subscriber/article/grove/art/T057228pg2, accessed 7 August 2009.